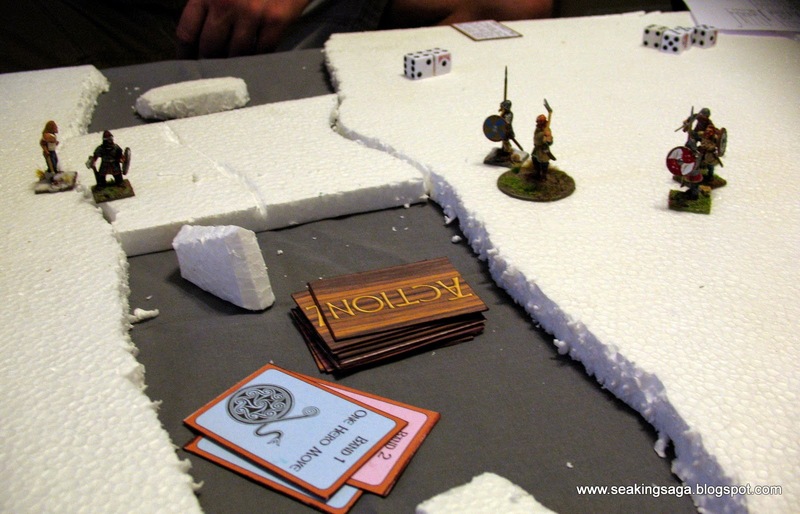 A game of Battle Troll was on the agenda this week. I have played Battle Troll a few (3 or 4) times, owning both the pdf and printed copy. A few games were solo scenarios and its card driven combat mechanic can function well as an autonomous opponent. I also played it with my young son, who liked the card artwork and could grasp some of the basics. In these experiences, I avoided using the full combat rules, which took into account hit location and armor coverage. In this game, my usual wargaming buddy and I decided to go all in on Battle Troll, with hit locations, weapon distinctions and accident charts. 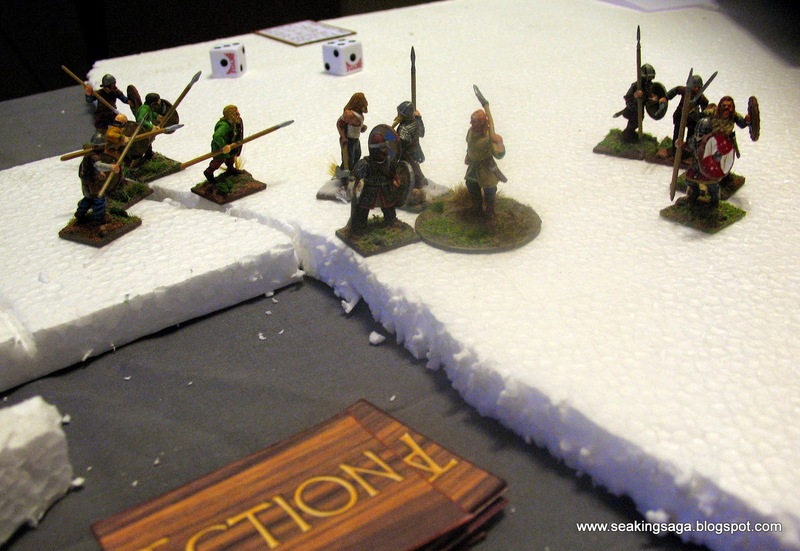 The scenario was "The Ice Floe" Both sides start on rocky outcroppings and battle on the ice. The ice is broken in the middle, with a somewhat stable ice floe to cross. It is based on an incident from Njall's Saga, with one side led by Njall's son Skarphedin, and the other side by Thrain. 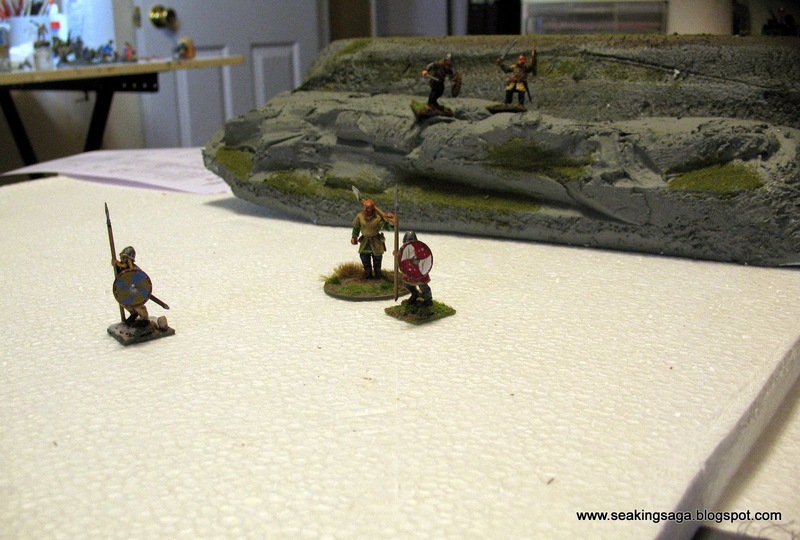 Skarphedin (on the large round base) and two other heroes slowly cross the ice. Movement is not set, as in SAGA and other skirmish games. 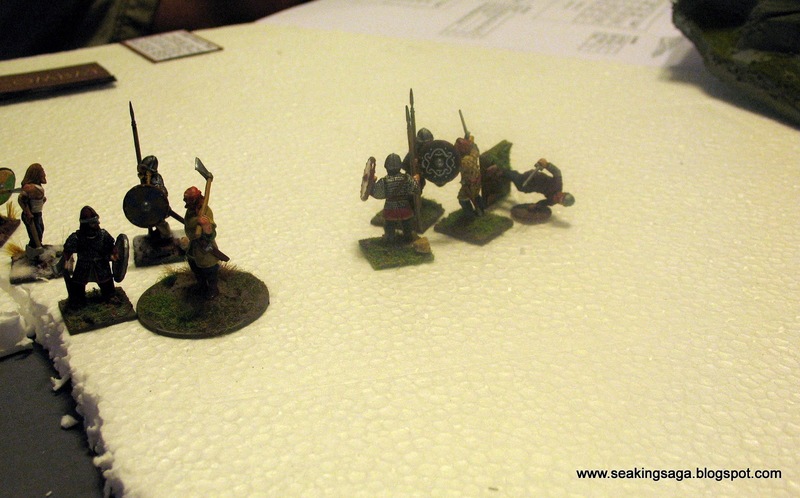 Players roll 2d6 for walking and 3d6 for running. If you roll a "1" in this scenario on a run, you fall and slide the distance rolled. Which, if its into the icy gray river, is instant death. No IGYG here, player order is determined by draws from a deck, with 6 cards activating one or more of your troops, six cards activating your opponents and one card ends the turn, resulting in a reshuffle. Combat is resolved by choosing an attack action (swing, cut, lunge or jest) and a counter action (block with shield, counterblow, jump aside, jump back and jest). The effectiveness of one attack against another generates a certain number of dice for each player. Jests are useful in that they score reputation points against an enemy, which actually determines the winner of the game. So does a kill obviously, but if you can insult your enemy before killing them, so much the better. The first one down is one of mine, slain by Thrain. The next kill is by my leader Skarphedin against an enemy hero. Skarphedin lands a Great Blow, which earns him 6 Reputation Points, but also earns the dead character points for dying in such an epic manner. Finally, after over an hour of game play, two characters lay dead, although most are wounded to some degree. The game is called. My opponent leads in Reputation Points, due to wounds inflicted and his liberal use of jesting. Resolving combat was very slow going at first and it improved somewhat as the game went on. Wargamers who like checking and cross referencing charts will find this system a breeze. Those who like to roll dice, see who has the best number might find it slow going. Wounds need to be cumulative - which as best I could tell from the rules, they were not. Characters may be slightly wounded multiple times, with no consequence past letting an opponent re-roll a single die. This would also speed up combat a bit, but might be an impediment to those playing the campaign, and need characters to survive and fight again. Wound markers for each character is a must. Even though we were writing down who was wounded, numerous times we finished a combat and then remembered we could have had a re-roll against a wounded opponent. A final endorsement is the material included. Of the 80 pages, 24 are devoted to rules, with the remainder covering campaign rules - hiring men, building a hall, and lawsuits (seriously) - and numerous scenarios that are historically based and easily transferable to other skirmish games. My friend's comment was that this combat system was basically an RPG system and I agree. I might actually like to see more tactical RPGs use a reveal system similar to this, preventing players from "modifying" their actions mid-combat. Hopefully I can run this game in the future, but here is a look at some of the characters and terrain I had planned for that game. 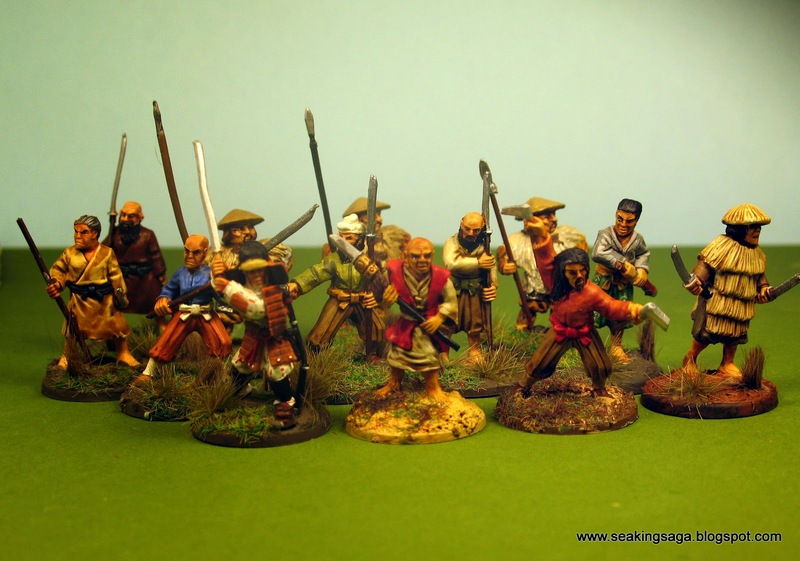 Most of my figures are from the early Samurai period (11-13th century). This era also saw the rise of militant Buddhist monks, in which rival temples fought over relics, property and imperial favor. In this four person scenario, a sacred scroll currently possessed by one temple of monks has been awarded to another - but the owner's won't give it up peacefully. The owners of the scroll, along with nearby villagers who have a vested interest, are fighting to keep the scroll and the pilgrimage income it generates nearby. Two players would then control the monks and villagers respectively. On the attack are the monks seeking the scroll, along with a small group of warriors who wish to see the imperial orders carried out. Each set of allies has to work cooperatively to win, but victory points are awarded based on number of enemy killed and who has possession of the scroll at the end of 7 turns. 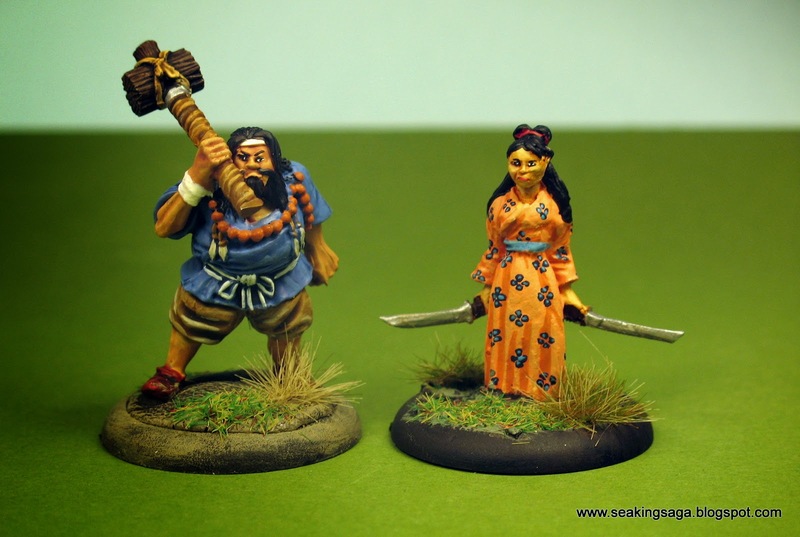 These two characters are from West Wind and would have been the leaders of the peasant faction. 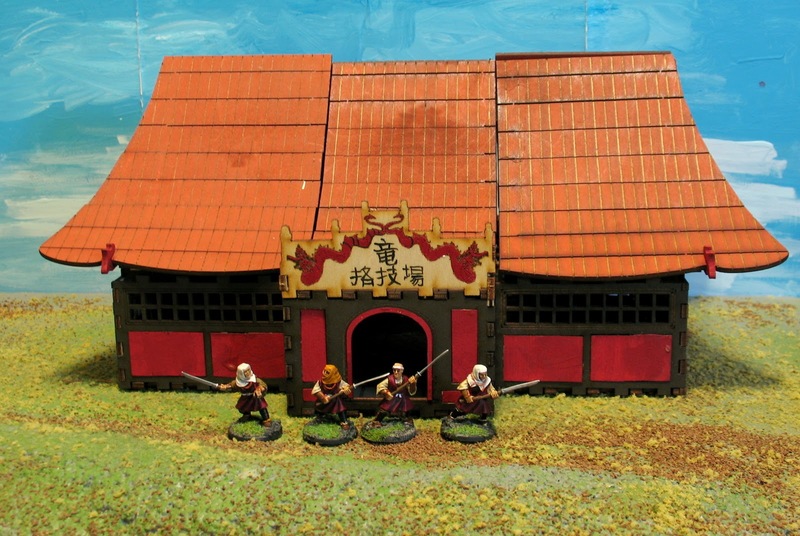 Added to my previous sets of monks, was this unit of Sohei in red, to match their temple. Here is the temple that housed the sacred scroll. It is from lasercut MDF by Renaissance Miniatures. It was from their second Kickstarter and it assembled very quickly. The roof is removable, but a bit fussy to snap in place. It is in three sections, which is better than a single section, but it can be difficult to get all three to snap into place. With any MDF kit, the larger the pieces or span of assembly, the more likely that small gaps will develop that can prevent an exact fit. The gaps can be from using too little glue and not clamping it long enough so that the parts drift as they dry, or alternatively using too much glue, which spreads into spaces meant to be left open. 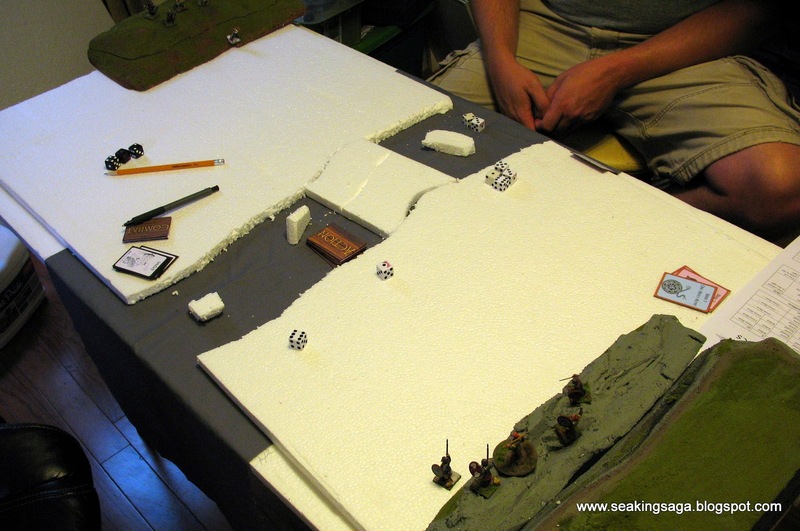 The interior is large enough for a combat scenario, or to add some small furnishings. 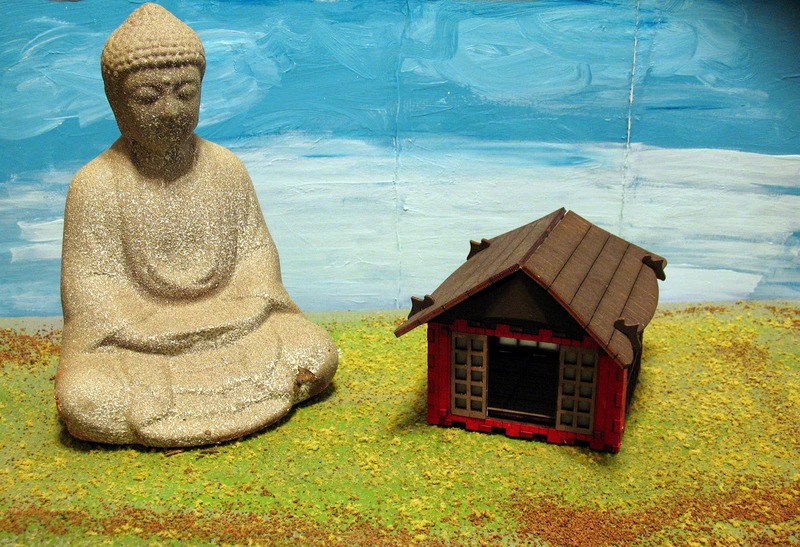 A statue of a Buddha from a home store ($3 on markdown) makes an appropriately sized massive idol. 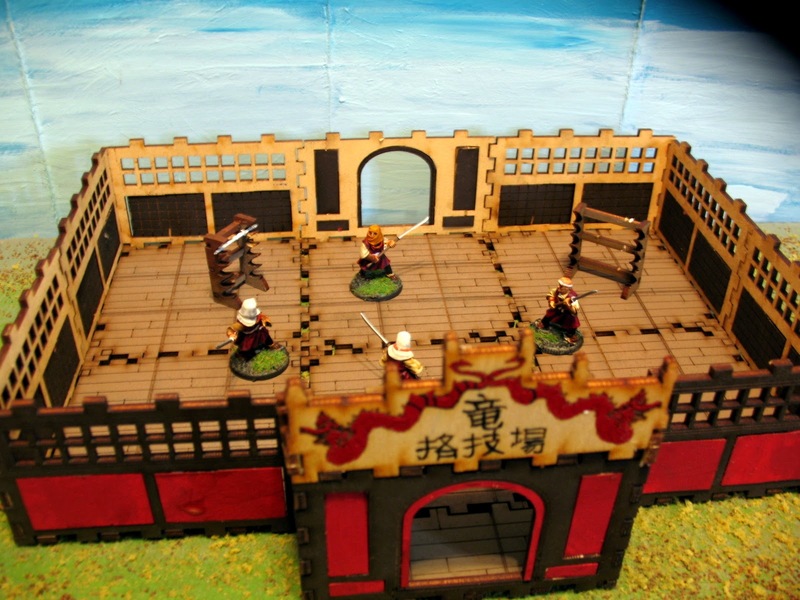 The small building is also from Renaissance Miniatures. If you are into pirates or Old West, Renaissance Miniatures has a few days left on their third Kickstarter. I am still undecided about it - pirates are an era I have considered but I am not sure if its the right time to add more projects - but the company is very good at customer response, updating and delivering in a reasonable time. Check it out if you are interested. In anticipation of some upcoming Ronin matches, I put together a third faction, in addition to the monks and samurai. As my preferred setting is the late Heian and early Kamakura period (11th-13th centuries), I try to be careful when purchasing Samurai. 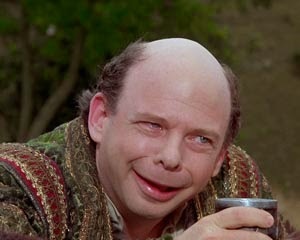 But, much like in western history, peasants are fairly interchangeable across many time periods. 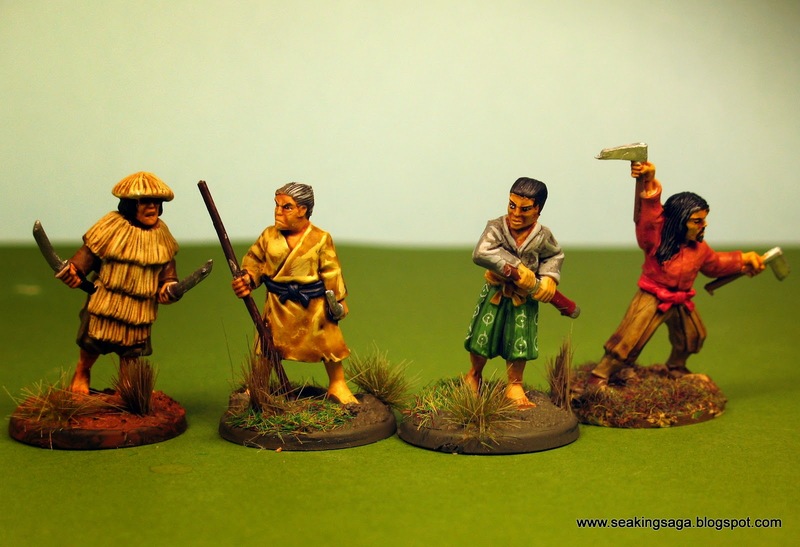 Fortunately, my favorite Samurai producer, The Assault Group, also makes two sets of Japanese peasants. 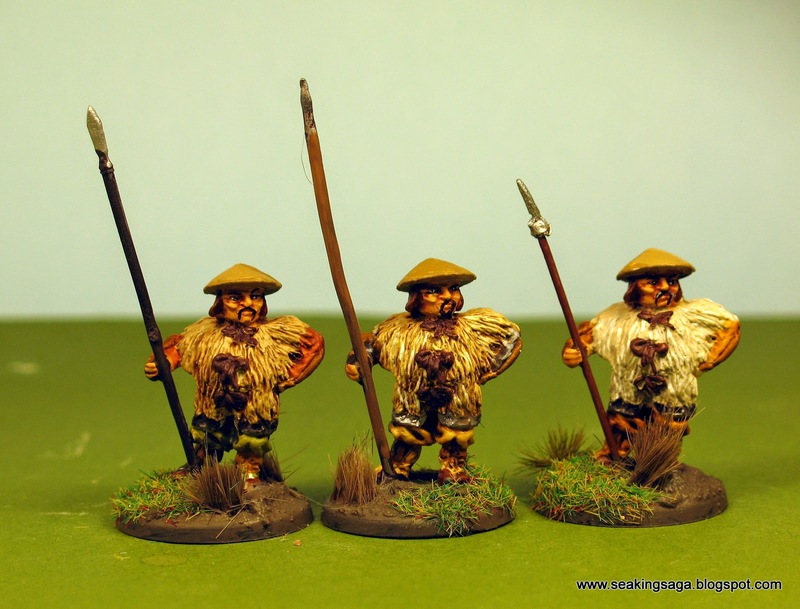 Unfortunately, eight figures does not make for much of a peasant buntai in Ronin. 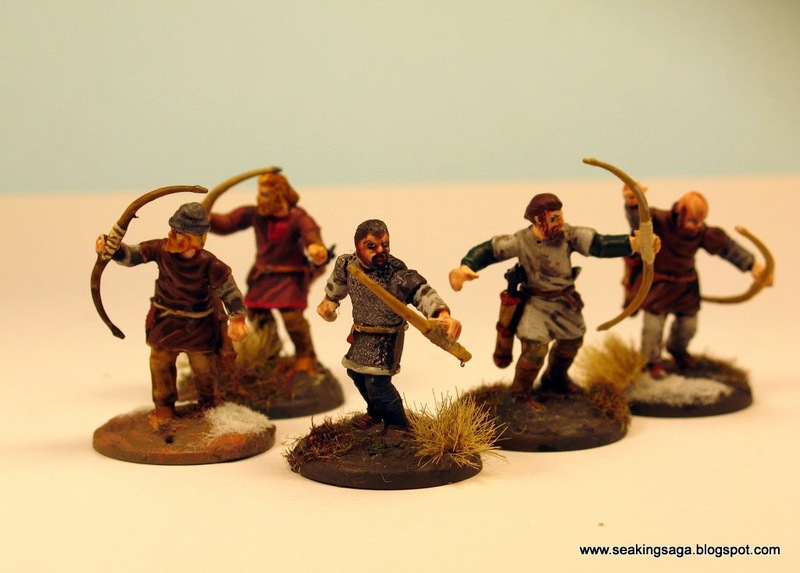 These eight would cost a total of 48 points (4 per figure, and an extra 4 points for the spears) - which is equivalent to two Samurai. All in all, it is probably an accurate equivalency, but running them as bandits could upgrade a couple of them. To round out the peasants, I made an ebay purchase for five of these unnamed figures in Japanese straw coats. Properly called the mino, it was a rain coat or rudimentary protective gear worn from ancient times to the Edo period. No manufacturer was identified by the seller, but from the proportions, it looks like Curteys or Dixon. However, I couldn't find a matching example on either website. Suggestions? 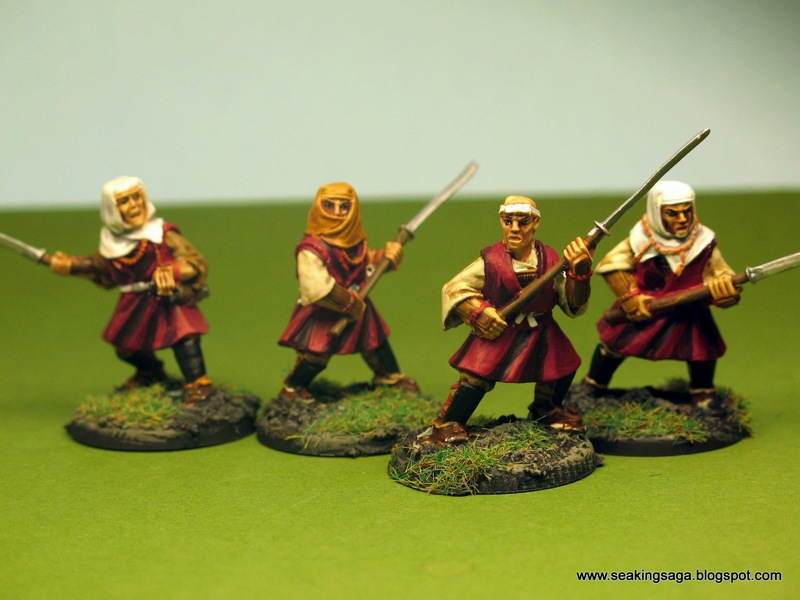 A few of these slightly better armed peasants would bring my point total up to 96 points. 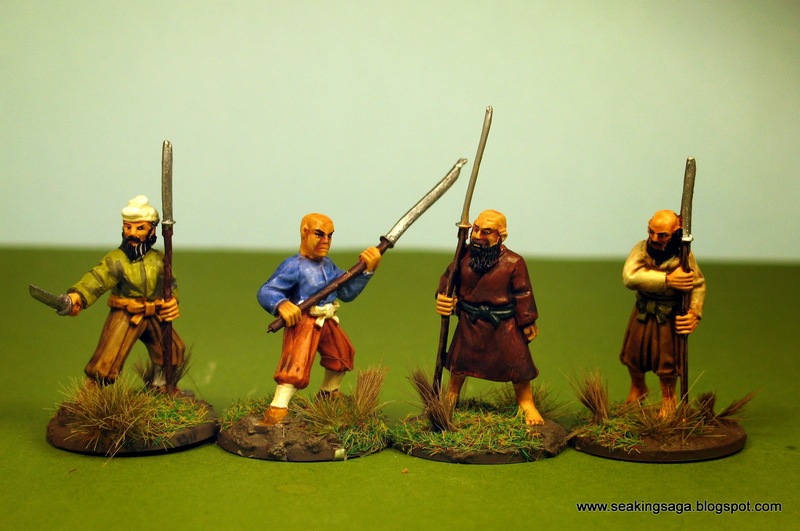 Peasants can also hire any number of Ronin or a single Monk. Adding in a single Ronin (Assault Group) and a Monk (Reaper) brings the peasants up to 150 point, enough for a quick game. They look sufficiently determined, but I doubt their effectiveness in battle. One bonus to this faction is the ability to earn victory points at a higher rate than other warbands, which could up for their obvious disadvantages. 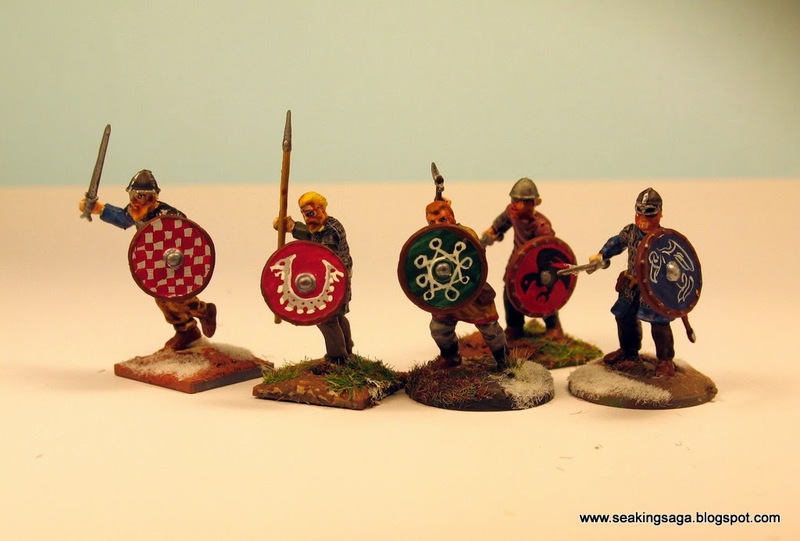 The first plastic figures I bought were the Wargames Factory Vikings and Saxons, probably five or six years ago. I realize the reputation those figures have, and deservedly so. Getting a good pose is difficult, hands have hitchhiker thumbs and many of the fine details are muddy and indistinct. That being said, they can be an efficient way to fill out large warbands. Plus, their sprues contain many arm and weapon options that should find a place in your "bit box" for future conversions. I originally based them on thick card and rather poorly at that. I decided to rebase them on square and round bases, mostly with snow and winter grass. 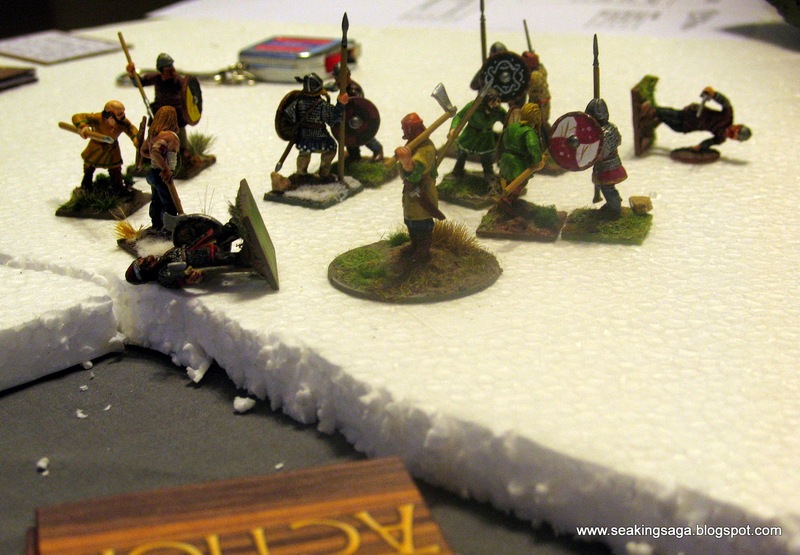 The plan is to build a snow scene for an Icelandic feud scenario. A test figure came apart when I stripped it with Simple Green. It was easily rebuilt, but I didn't want to invest the time into completely re-doing cheap plastics. I decided to just apply some washes and highlights as well as redoing shields. 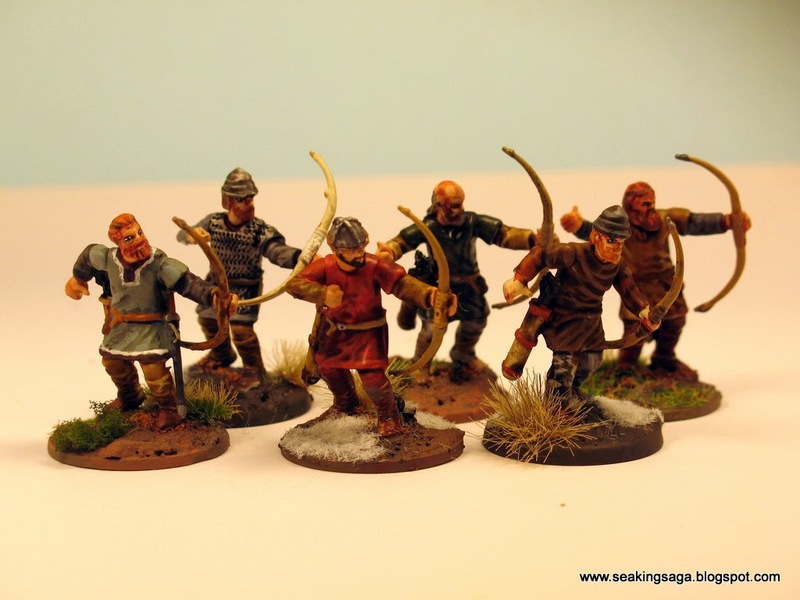 Until some better plastics are made, the Wargames Factory are the only option for cheap Dark Age archers. Below, some good examples of the unique options available. 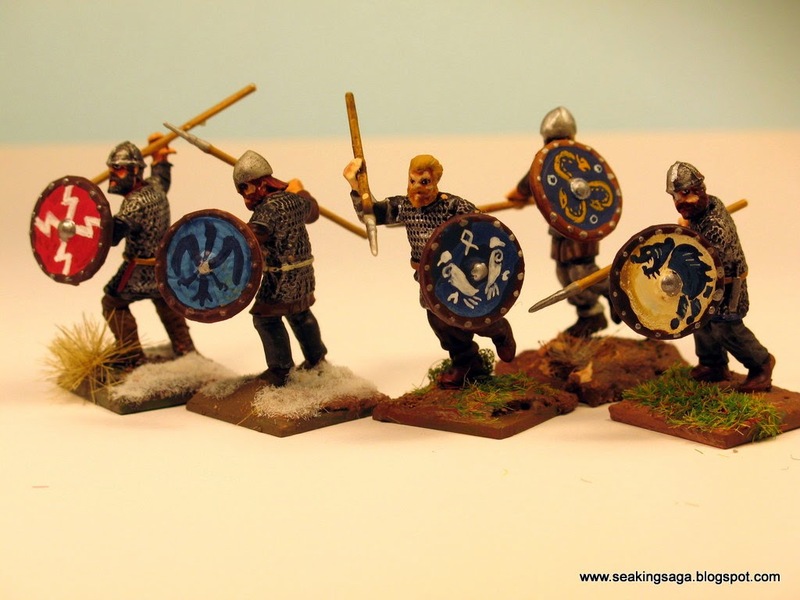 On the left, a warrior with a small Axe held inside the shield, a practice attested to in some of the sagas. 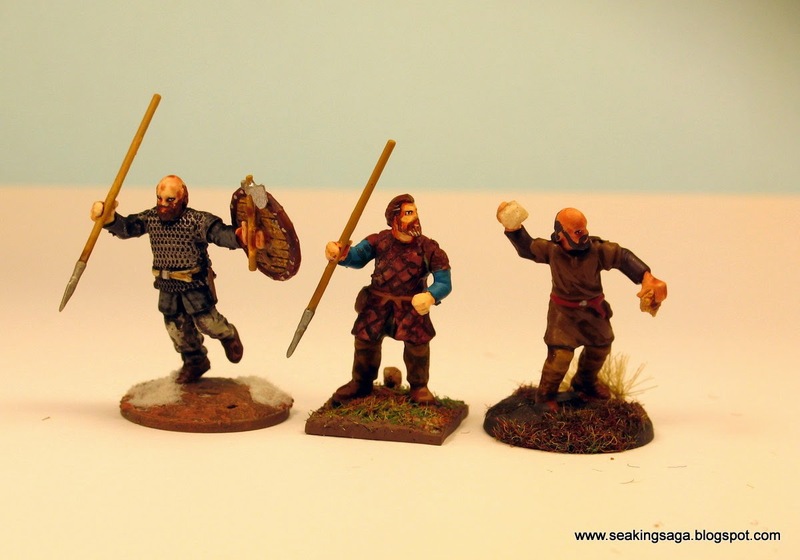 The javelin thrower and stone hurler can fill out the skirmishers. There's a lot of reasons to avoid these figures with better options now available. On the other hand, some of them painted up rather nicely, and I am glad to have the extra heads, arms and weapons. And, I think most agree that the company's figures have improved quite a bit since the early days. 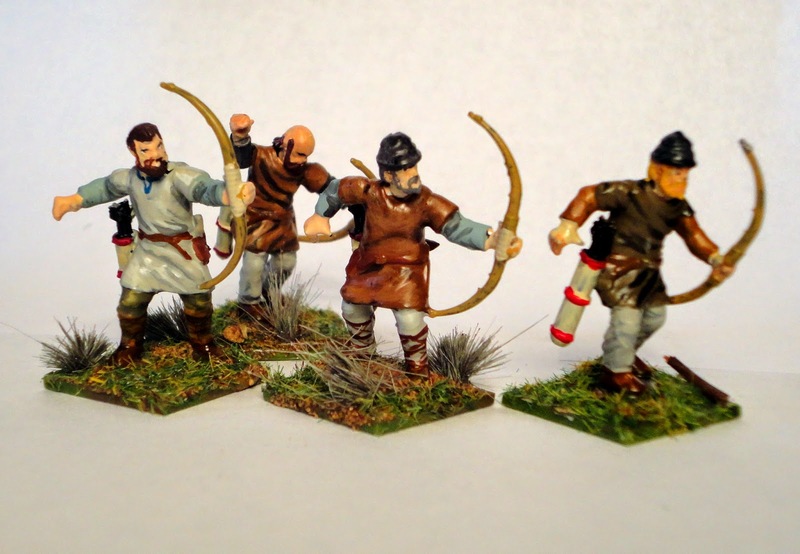 I am eager to buy their AWI Continental Infantry and Woodland Indians.